For many of us die hard Ngoc Lan fans, we really loved it whenever she had teamed up with Kieu Nga on their many duets recorded together. 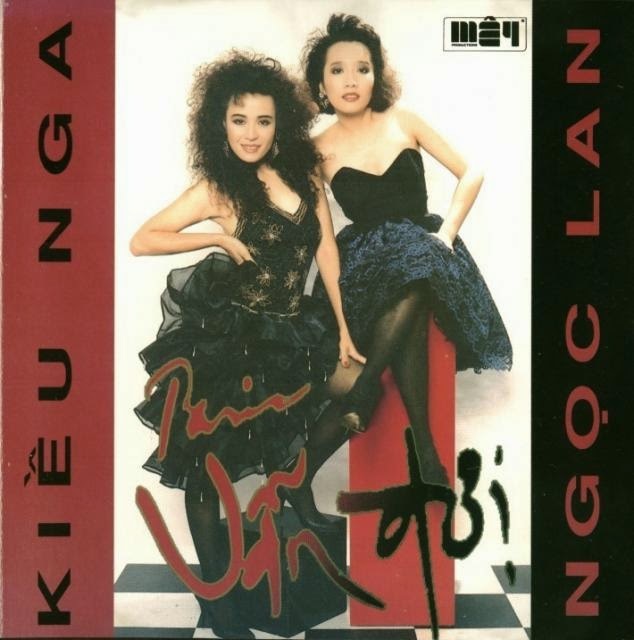 During the latter years of the 1980s, when it came to the Vietnamese music genre known as Nhac Tre, there was no doubt that Ngoc Lan and Kieu Nga were the two most celebrated divas. When May Productions had released this album in 1990, I was sort of displeased with the mediocre level of production. In a way, it seemed like a rehashed version of the magic that Ngoc Lan and Kieu Nga had once captured in their earlier recordings with Asia Productions and Nguoi Dep Binh Duong years ago. I'd have to say that I enjoyed listening to Ngoc Lan and Kieu Nga's earlier duet album released by Nguoi Dep Binh Duong back in 1988, Khong Can Noi Yeu Em, a lot more despite how its less elaborate arrangements and promotion efforts. They both sounded much more natural and much more energy in the deliveries of the songs recorded. In Paris Van Doi (Paris Still Awaits), a lot of the songs they had selected seemed like variations of songs they had each recorded before, only scrambled among one another, or by other Vietnamese singers on compilation albums they each had appeared on. For example, there was En Courant, in which Kieu Nga had recorded for Nguoi Dep Binh Duong a couple years prior. Johnny Johnny was another one Kieu Nga had recorded for Asia Productions. And L'amour à la Plage that had been recorded by Julie , also known as Julie Quang on a compilation album that Kieu Nga had also been featured on released by Kim Ngan years ago. I can't say that Paris Van Doi wasn't enjoyable to listen to. It was. But I had expected so much more. If anything, the album is worth listening to just because it was an album that featured two of our favorites, Ngoc Lan and Kieu Nga, and for one other reason, the classic duet track, Toi Jamais. That track alone makes the entire album worth listening to.